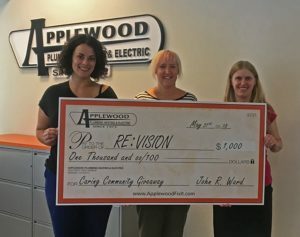 Applewood Plumbing Heating & Electric awarded $1,000 as part of their monthly Caring Community Giveaway to Re:Vision, a local non-profit based in Denver’s Westwood neighborhood. Re:Vision started in 2007 with a mission to rethink community development. Since then, with the help of its residents, Re:Vision has transformed the community by growing food systems, developing local leaders, and building a locally-owned economy. Westwood is one of the most culturally vibrant neighborhoods in the Denver Metro Area, with over 81% of its residents identifying as Latino. Known for its delicious tacos and pho, Westwood is actually a food desert, which means that most of the population has limited access to affordable healthy food. Through Re:Vision’s Re:Farm program, low-income families overcome the barriers of living in a food desert by learning to grow their own food. Residents are provided with a Promotora, a mentor who helps them through the gardening process, and resources such as seeds, plants, compost and irrigation systems to convert their yards into high production organic vegetable gardens. Since 2009, they have cultivated more than 1,700 cumulative gardens. “Helping non-profits like Re:Vision is such an honor. To know there are people in our community helping others in such a positive way warms our hearts,” said John Ward, Applewood Plumbing Heating & Electric president. For more information about Re:Vision visit www.revision.coop.